A rally was held on September 11, 2018 to pay tribute to the many who lost their lives 17 years ago. Today we take some time from our storm preparations to remember those whose lives were lost 17 years ago on 9-11-2001. On this Day of Remembrance, we also honor all first responders & branches of our military for their selfless & courageous service. 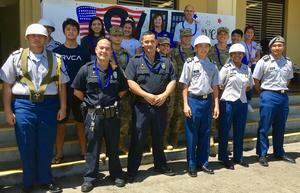 Mahalo to the representatives from The Hawaii National Guard, The Hawaii Police Department, The Hawaii County Fire Department, The Hilo High School JROTC Unit, and Viking Alumnus and The Hawaii County Band for taking the time to share your aloha with all of us today.